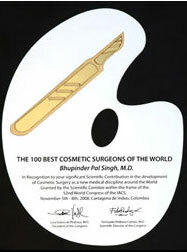 Liposuction most of the body parts, particularly abdomen, flanks, buttocks, hips thighs, upper arms, double chin etc. Tummy Tuck [ lipectomy abdominoplasty with repair of loose abdomen muscles and umbilicus reshaping/repositioning. Stitch lift procedure for face and breast.